Being asked to write this article was a great honour. Writing articles for shing media and magazines is something that takes careful thought and consideration to say the least! I have read many excellent articles around shing for salmon, y selection and venues. I decided to take the unusual step of writing about a subject very close to my heart – sh behaviour and how I link this to help me when searching for that most elusive of all prizes, a Salmon. as an elite anglers’ destination, a beautiful river whose steelhead were the equal of any on the continent in terms of numbers, size, strength and appearance. How times change. Steelhead – Are They Really Fish of 1000 casts? Wild Steelhead (Oncorhynchus mykiss) are an anadromous (sea going) Rainbow Trout (also referred to as Oncorhynchus mykiss), but also now been classi ed by biologists to be more genetically related to the Paci c Salmon (Oncorhynchus), with one large exception – Steelhead can be repeat spawners. 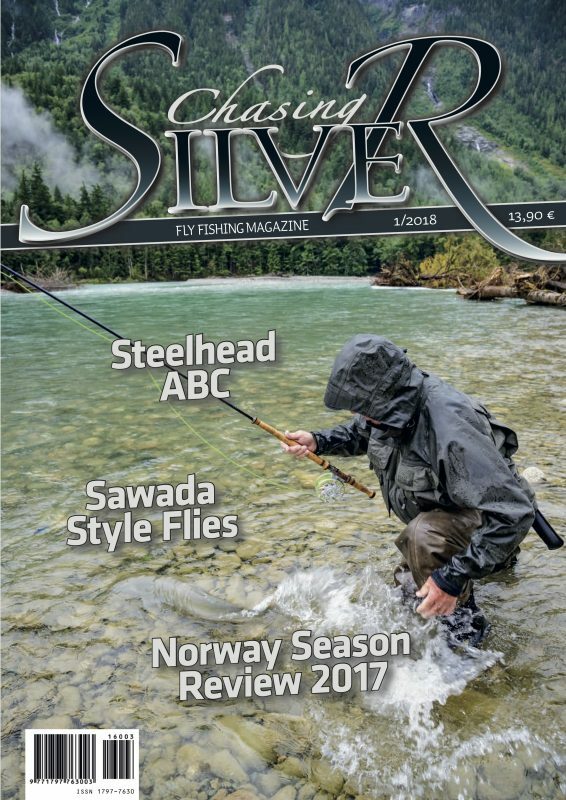 High floods almost all season, bonanza-near fishing in rivers Numedal, Orkla, Namsen and Vestre Jakobselv are some of the highlights of 2017, which overall had somewhat better fishing than 2016. Chasing Atlantic salmon in Denmark never really crossed my mind. But now, being one experience richer, the River Skjern (Skjern Å) during the spring is a must recommendation to anyone looking for early season fun. G enerally, the Atlantic salmon (Salmo salar, L.) will swim into the river in the same year it spawns. After the spawning, the salmon return to the sea as kelts either towards the end of the same year or the spring of the next one. With the Atlantic salmon, the spawning has largely been considered the end point of the individual sh in the species.